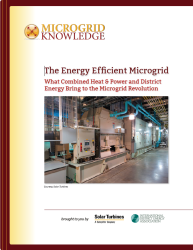 The editors of Microgrid Knowledge, working with other industry experts, have created these detailed Special Reports on on the following microgrid topics. Reciprocating engine generators are becoming increasingly important to help solve three contemporary energy problems. The first problem occurs in developed areas like North America, where electric reliability is crucial as the economy grows ever more Internet-based. The second problem can be found in remote regions of the world, where no central grid exists, or its service is spotty, hampering basic health, well-being and commerce. The third problem arises as we attempt to green our electric supply with solar and wind energy. Intermittent by nature-dependent on the sun shining and the wind blowing-renewables often need reliable and sustainable companion technology to keep the electricity flowing. 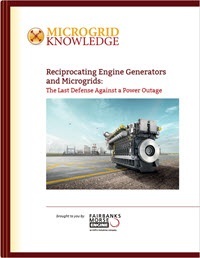 “The Guide to Reciprocating Engine Generators and Microgrids: The Last Defense Against a Power Outage,” explores the growing role that reciprocating engine generators play in solving these three problems. Click here to read this article series. Click here to down the full report in a PDF format. Microgrid financing has piqued the interest of investors and, communities, governments, universities, businesses and others. But customers are unsure if they can afford them, and investors are unsure how to monetize them. 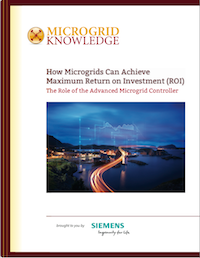 The editors of Microgrid Knowledge have prepared this special report on microgrid financing and the role of the microgrid controller in calculating the ROI. Click here to read the article series. Click here to download the full report in a PDF format. This Special Report is a guide for mayors and city leaders seeking clean, reliable and locally controlled energy. 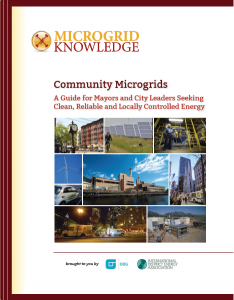 In this guide and article series, we describe how microgrids serve communities and explain why states like California, Massachusetts and New York promote their development, and offer substantial incentives to boost the industry. We also detail the key features of a community microgrids, how they work, the value of incorporating both electricity and heat into a project, and why microgrids foster development of renewable energy. We identify steps for cities and towns to take as they begin to develop a project, and discuss various finance options and incentives. Finally, we provide examples of communities that are already benefiting from community microgrids, and others well on their way. This Special Report paints a picture of the emerging microgrid-driven world, with Combined Heat and Power (CHP) at its core. For a long time CHP and District Energy seemed like the best-kept-secret of energy insiders. Learn how CHP and District Energy are the keys to building the world’s most energy efficient microgrids. Microgrids have become an important part of the nation’s plan to create a more resilient, secure energy system, one that can withstand the attacks of wind and water or hackers and terrorists. Should the central grid go down, microgrids can quickly “island” – disconnect to provide a continuous energy supply and protect their customers from the damage occurring on the larger grid. Therefore, the microgrid industry finds itself in a nascent and crucial stage. The outcome will determine how easy – or difficult – it will be for microgrids to position themselves in the marketplace. Ease of siting, franchise access, interconnection, regulatory approvals and financing depend on the outcome of proceedings just beginning in many states. How will microgrids be compensated for their services? Will they threaten the established utility business model, or serve as an operational ally and perhaps even a utility asset? Who will develop, own and operate microgrids in restructured states? 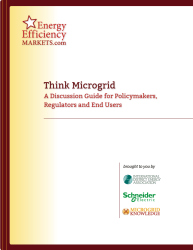 How will regulators measure and monetize the environmental benefits of microgrids? Click here to read this article series. Click here to down the full report in PDF format.